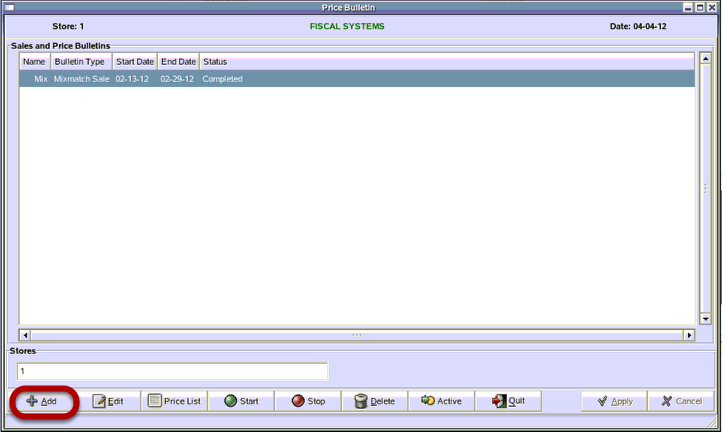 TravStar1 Point Of Sale SystemManager's Work Station Advanced Pricebook ManagementHow Do I Setup a Sale to Start on a Specific Date? How Do I Setup a Sale to Start on a Specific Date? 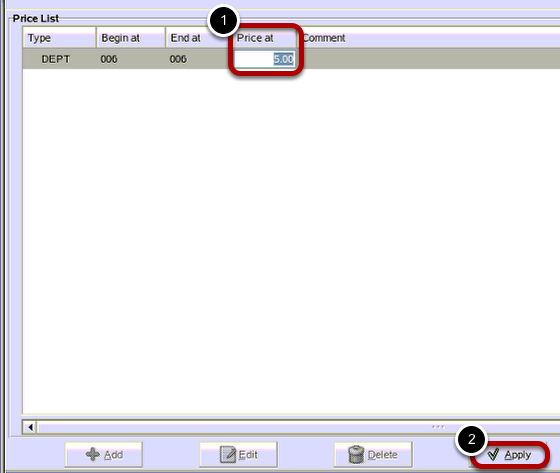 This lesson will teach you how to setup a sale to run for a specific date range. 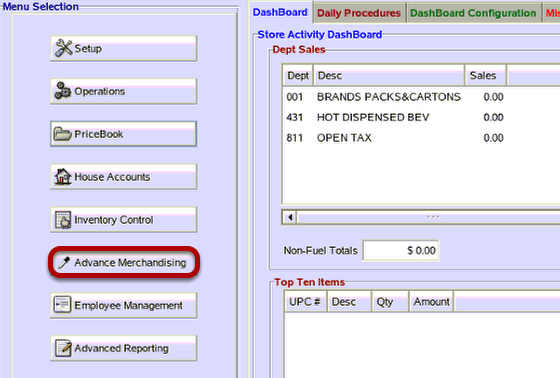 From the Advanced Merchandising menu, click on the "Sales and Price Bulletins" button. 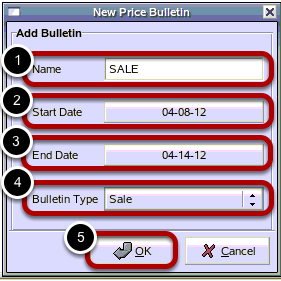 The Sales and Price Bulletins module is used to run discounts for items within the given date ranges. 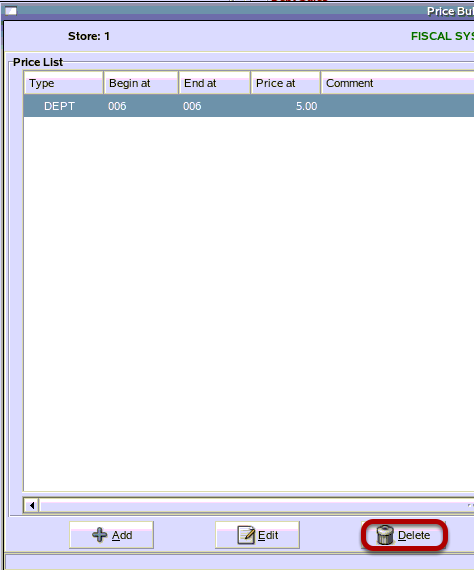 From the Price Bulletin screen, click on the "Add" button. For this example, we are going to setup a sale for all items in department 006 to have a 5% discount for one week. 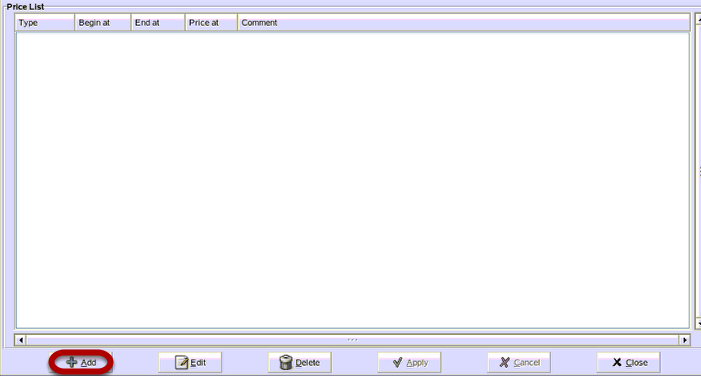 (1) From the New Price Bulletin screen, type in a name for your bulletin. (2) Click inside the Select Date box beside the Start Date. Click on the beginning date you want the sale to start on. (3) Click inside the Select Date box beside the End Date. Click on the ending date you want the sale to end on. (4) Click inside the box beside the Bulletin Type. Click on Sale from the drop down list. (5) Click the "Ok" button. Notice your new sale is now showing up on the Price Bulletin screen. The Status is set to inactive. 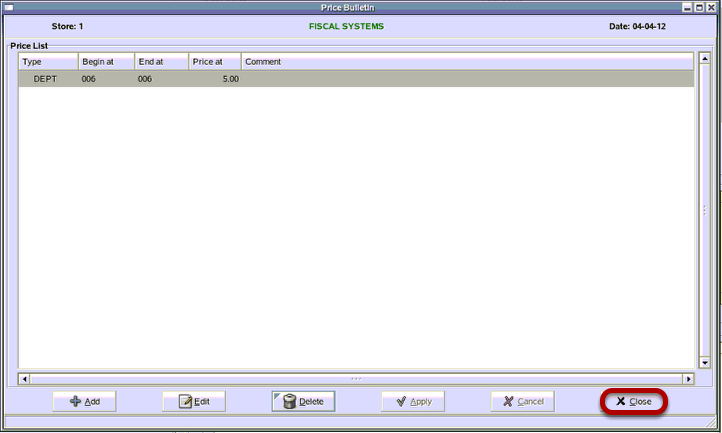 From the Price Bulletin screen, select "Price List" button. Since no items are applied to the sale, this error message will appear. Click on the "Ok" button. Once a sale has been created, you must add items to the sale. From the Price List screen, click on the "Add" button. 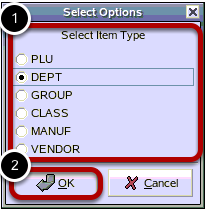 (1) From the Select Options screen, click on the Select Item Type for what grouping of items you want to run a sale on. (2) Click on the "Ok" button. 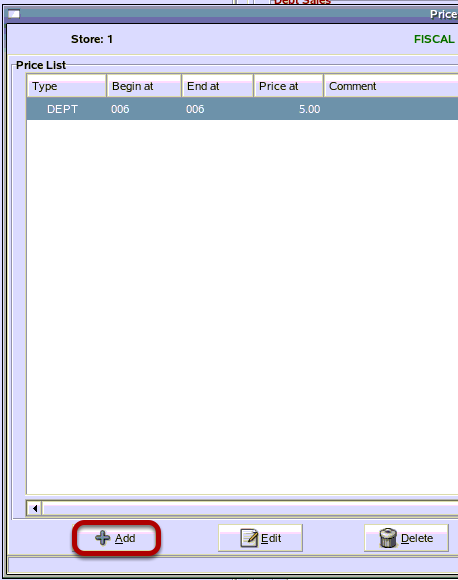 (1) From the Price List screen, click inside the Begin at column and type in a beginning department. Do the same for the ending department. Note: If you selected PLU, you will enter a beginning PLU and ending PLU. The same goes if you selected group, manufacturer, or vendor. (2) Click inside the Price at column for the new sale. 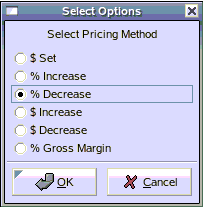 The Select Option screen shows the pricing methods you can apply to the sale. Click on a method, then click on the "Ok" button. (1) From the Price at column, type in the discount being applied to the sale. (2) Click on the "Apply" button. From the Question screen, click on the "Yes" button. You can add additional Item Types to the sale by clicking the "Add" button. 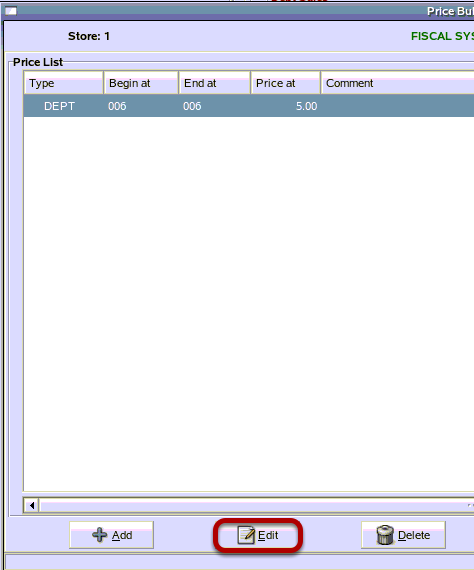 You can edit you price list items by clicking on the item, then clicking the "Edit" button. You can delete your price list items by clicking on the item, then clicking the "Delete" button. A screen will open prompting you "Remove Price Update List Item?(Y/N)". 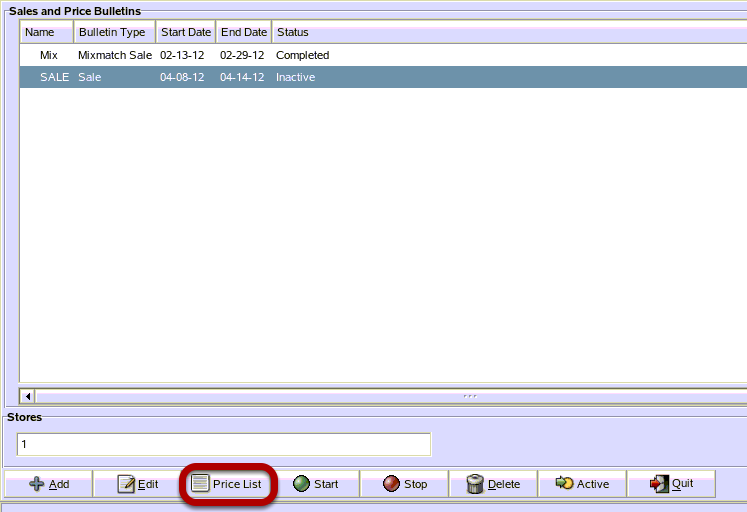 Click the "Yes" button to delete the item or click the "No" button to cancel and return to Price List screen. From the Price List screen. click on the "Close" button. 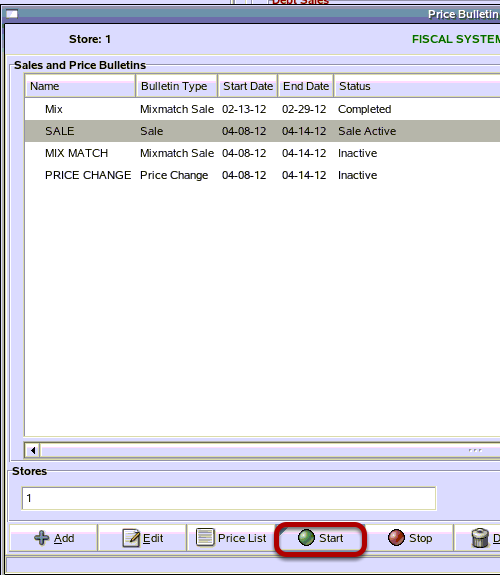 From the Sales and Price Bulletins screen, click on the "Start" button. This starts the sale. Prev: How Do I Apply a Buydown ID to Multiple Items? Next: How Do I Setup a Mix Match to Start on a Specific Date?